Connect your Prestashop easily with marketplaces like eBay, Amazon, Rakuten, PriceMinister or Cdiscount. Upload products, import orders or synchronize stock and prices automatically. These are the most important distribution channels to increase your sales dramatically. Use your Prestashop in combination with the magnalister addon and make your store a distribution, inventory- and order-management-system. 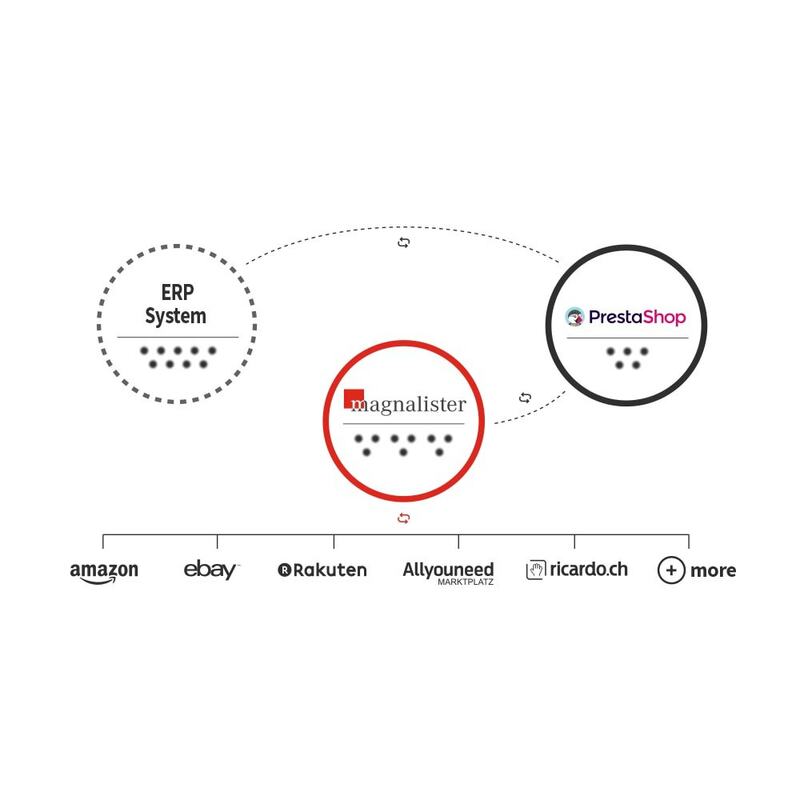 ​magnalister is the ultimate connection between PrestaShop and eBay, Amazon & Co.
- Automatic transmission of status like "shipped" or "paid"
Many additional features like variation-transmission or usage of different price groups makes selling more easy. Free 30-day trial! : Immediately after the notification and shop-registration, you will receive your personal unique activation key (pass phrase). With this key you can activate and use the software to it's full extent. No additional or further costs are incurred during the 30 days test period. After the free trial, magnalister costs starting from 29 EUR excl. tax. 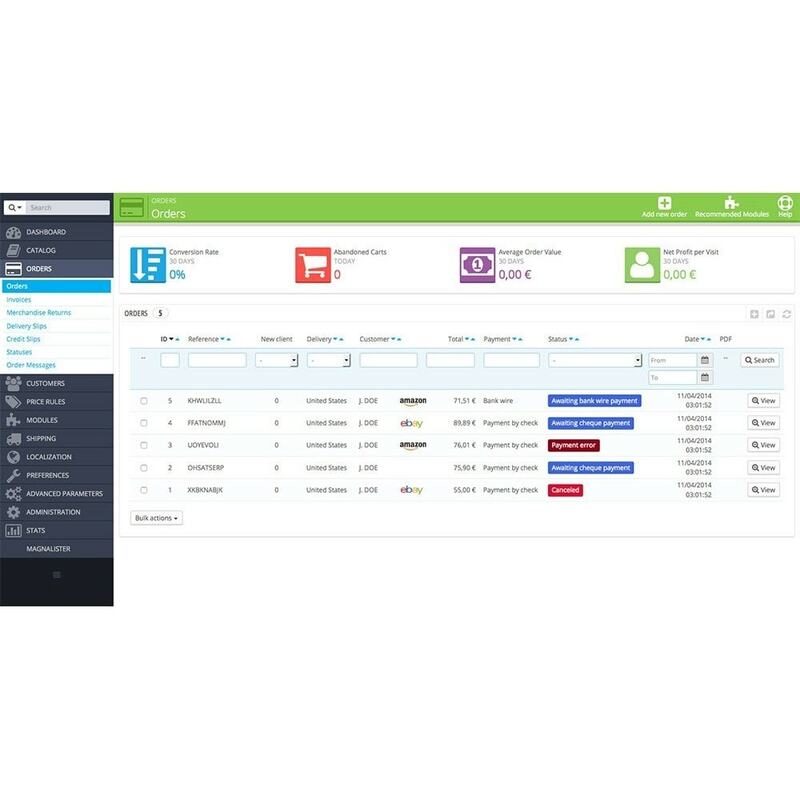 magnalister is an addon, that integrates seamlessly and makes your Prestashop a multi-channel marketing and inventory-management-system. No third party web-application is needed. magnalister is the leading multi-channel-addon in Europe and managed orders worth more than 1 billion euros so far. 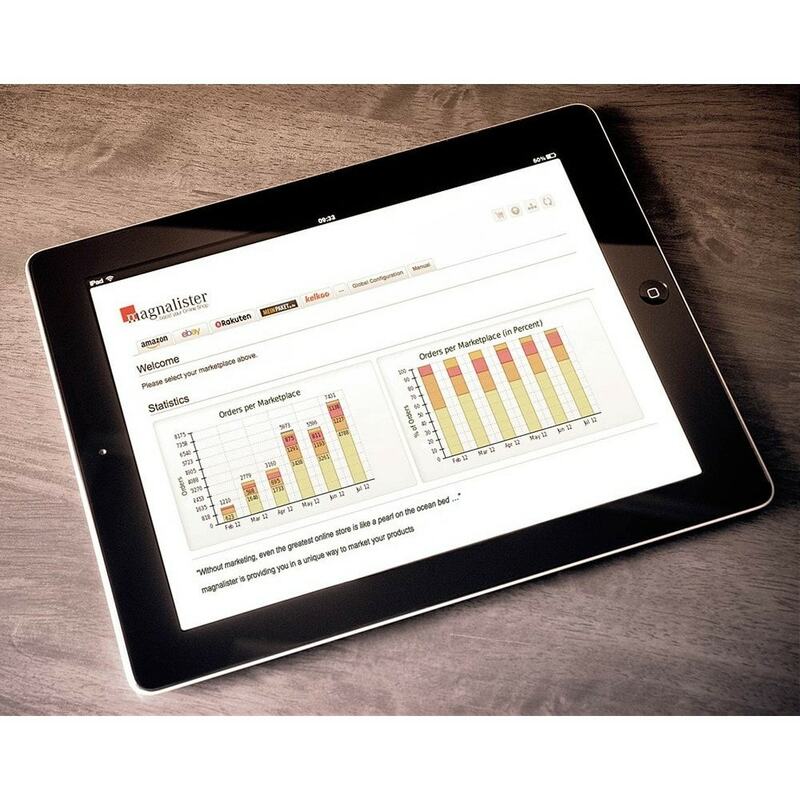 magnalister evolved over 7 years and provides the addon with all the experience from thousands of customers. Beside flexible standard functions, magnalister can be customized by an internal hook-point system to the individual needs of any merchant. 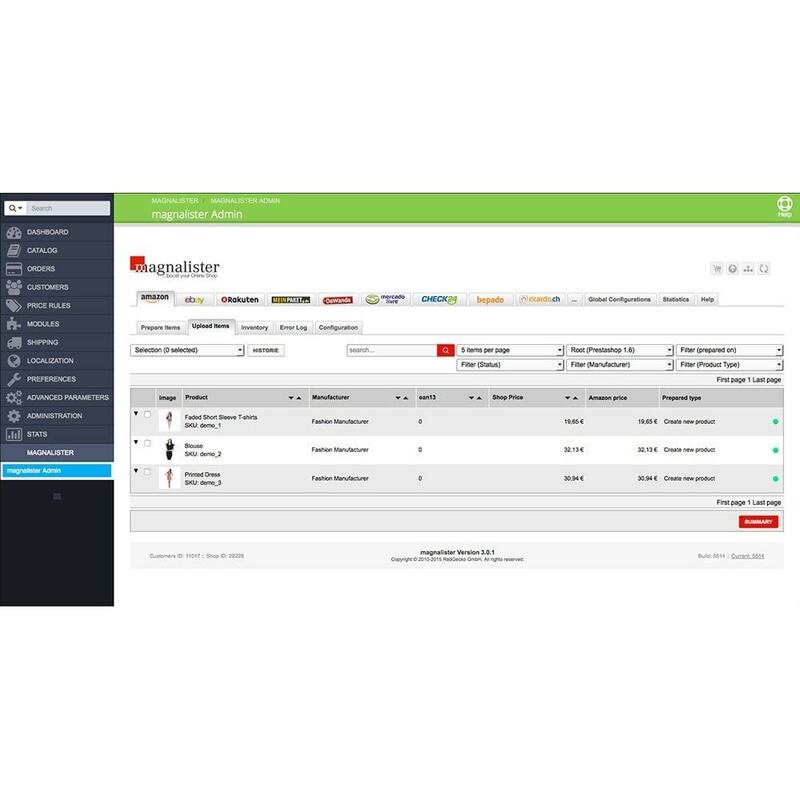 For your customers magnalister means easier and faster order management with all important data at one place. Этот модуль соответствует требованиям европейского Общего регламента по защите персональных данных. 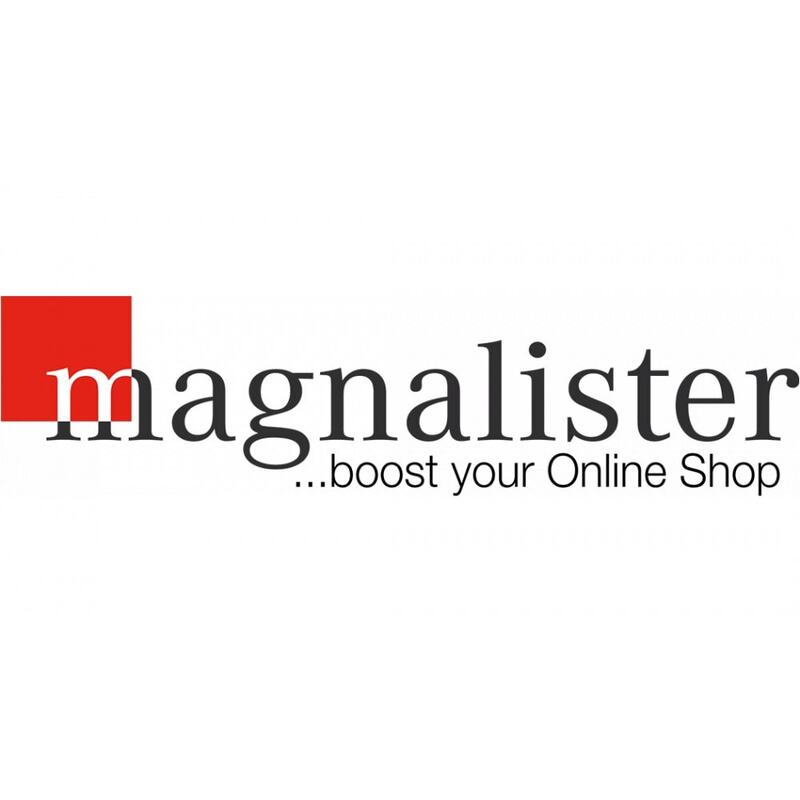 To install magnalister, simply click "download" in the up right or go to http://www.magnalister.com/download/ and download the ZIP-File. In this Zip-package you will also find an installation guide. After a brief registration on www.magnalister.com, you'll receive a key (passphrase) to activate and configure the magnalister addon. Compatibility issue with Prestashop 1.7.5 is solved. Best-seller and exclusive on PrestaShop Addons, the Amazon Market Place module is the #1 solution to export products on Amazon, import and manage orders from the marketplace. EBAY2 allow you to easily export your items from PrestaShop to eBay, one of the largest marketplaces in the world, to attract new customers and increase sales.